The tablet is packed with features including two snappers, excellent video player, HTML browser, social integration and preloaded widgets. The lack of optimised apps is its only shortcoming. Lighter and slimmer than the iPad 2, the Tab 10.1 is nevertheless a solid piece of kit, with a high-res 10.1in screen protected by gorilla glass. We managed to get a day out of the battery from the Wi-Fi tablet we used, but the 3G version will use even more juice. Performance is smooth thanks to the 1GB of RAM and dual-core 1GHz processor. Gamers will enjoy the Tegra 2 graphics processor, which allows you to run high-intensity games, and the PLS display offers fantastic brightness and colours. Customising the five home screens is speedy and easy to carry out. The Honeycomb 3.1 operating system works smoothly and is user friendly. While the iPad may be the market leader - Samsung has certainly thrown down a challenge in the shape of the Samsung Galaxy Tab 10.1. It's more slender than Apple's offering, weighs less, and if Samsung has got it right, just generally better. The Korean company was so keen to get one over on Apple that it took its chubbier Galaxy Tab 10.1 off the shop shelves when the slimline iPad 2 came out. So can this much-anticipated Android Honeycomb tablet live up to the hype? The Galaxy Tab 10.1 weighs a slimline 565g, compared with the iPad 2's 600g. You may not notice the difference if you held them side by side, but still the Tab is really light. This is especially impressive when you consider that it is comparable with the likes of the Motorola Xoom, a weighty 10.1in tablet, as well as the Asus Eee Pad Transformer, that can be a bit of a hulk when it's connected to its keyboard dock. It's on the looks front that the iPad 2's smooth aluminium body wins one over on the Tab's plastic chassis. However, the Tab 10.1 is still the nicest looking Honeycomb tablet we've seen. Its waist measures 0.2 mm less than the iPad 2 and it measures 256.7 x 175.3 x 8.6mm. The screen (which measures 10.1 inches and boasts an 800 x 1280 pixel resolution) is covered by gorilla glass, so should have some protection from marks and knocks. The display is the brightest yet seen on a tablet, which is due to the new PLS technology (more on that later). Camera-wise, the Tab 10.1 boasts a 3.15 megapixel snapper, with flash and autofocus plus a front-facing two-megapixel camera for self portraits and video calls. There's also a 3.5mm audio jack and two speaker vents on each side of the device. You'll find the power button on the top of the tablet. That's also where the volume rocket sits, which is a bit of a nuisance - it's better on the side if you hold a tablet in landscape mode. What you won't find are any ports - which is where Samsung has chosen to follow in Apple's footsteps. Nor will you find any buttons on the front of the device. Samsung has also omitted any microSD memory expansion (so you are stuck with the amount of onboard memory - 16GB, 32GB or 64GB, depending on which model you have bought) or microUSB connection. If you want to connect accessories, you'll have to use Samsung's proprietary slot, which doubles as the charging slot. The Tab 10.1 has overtaken most of its rivals by sporting on launch the upgraded version of the tablet operating system Honeycomb 3.1. The latest version has the benefits of improved power management as well as resizeable widgets - only owners of the Eee Pad are able to update to this version. It pretty much looks like your usual Android with a touch of Samsung added via its TouchWiz 4.0. Icons have the Samsung treatment as do a lot of the preloaded widgets. Waking the device occurs via a smooth unlock mechanism whereby you drag a small lock out in a circular motion. Once it's on, you'll see five customisable screens, on which you can add widgets, contacts and shortcuts. There's a toolbar where you'll find home, back, recent-programs buttons - plus it's the first time we've seen a dedicated screen-cap button in Honeycomb. You'll be able to see your last 13 programs in recent-programs. Navigation is easy, as the toolbar sits along the bottom of any program you're in, making it an easy process to hop between programs or go back to homescreens. Multitasking is smooth and speedy thanks to the inclusion of a 1GHz dual-core processor and 1Gb RAM. You can bring up six shortcuts using a little arrow in the middle of the screen - calendar, music player, task manager, as well as the less likely pen memo, calculator and world clock. It's a shame you can't customise it to include your own most-used apps. Android users will already know that you need a Gmail account to activate any features on an Android device - once done, everything Google-related will be synced to the tablet - that includes Android apps and Picasa albums. When it comes to social networking, it's down to the Social Hub, something that any Samsung Galaxy owners will recognise. The app aggregates your Twitter, Facebook and LinkedIn accounts so that you end up with one calendar, contacts book and news feed. You can post photos and updates and also choose whether you see all your social networking events at once or just see one feed at a time. It's just a bit of a shame that while you can merge contacts on different accounts - say Google, Twitter and Facebook - it has to be done manually one at a time. HTC has managed to get its Android phones to do this automatically. As always with Android, email is split into a Gmail app for the main account and another for any other email accounts. You new mail alerts will pop up in the bottom left of the display. The Tab 10.1 also features Samsung's Swype, which allows you to write quicker using one finger, which you drag from letter to letter. We've always been impressed with Swype but found it less accurate on the Tab, and a tad sluggish. However, it's still better than the traditional typing approach found on most tablets. What we really liked was the universal calendar, which brings together all your events and birthdays and appointments from Facebook, Google and Microsoft Exchange. We were very happy to find a tablet that offers support for online video. The onboard video player is able to play lots of video formats, including Xvid and DivX - the formats used for most online video. It also offers support for the H.264 and MP4 formats supported by the iPad 2. While many bemoan the lack of Flash support on Apple's devices, the Tab has one up on its rival. Its onboard browser Dolphin offers Flash support, so you'll be able to watch embedded movies on news websites, such as the BBC's. We're not so sure that Flash will be so important in the future, as other options are being developed, but at the moment, much of the content on the web needs Flash. Talking of viewing films, you'll benefit from some fantastic colours and viewing angles, thanks to the new PLS technology - it's a vast improvement on the iPad 2 display. If you want to watch films or TV, the Tab is a far better choice than the Apple tablet. If you want to transfer files, it's easy - connect the included USB cable and then simply drag and drop. The computer will recognise the tablet and you can easily move images, music and video on to the device's usefully labelled folders. If you want to use Wi-Fi, use the preloaded Kies, which allows you to connect to computers on the same network if you want to transfer or stream files. The tablet can also be connected to an HDTV, but you'll have to buy the necessary cable. It is also possible to stream video - the Tab 10.1 supports both HSDPA as well as the most up-to-date, speedy Wi-Fi 802.11n. The good news for games fans is that you'll benefit from quick and beautiful rendering of images, thanks to the Tegra 2 graphics processor. Games such as Samurai II: Vengeance THD and N.O.V.A. 2 HD lend themselves to the Galaxy Tab 10.1. When it comes to apps, the Android Store is bursting with them - about 400,000 at the last count. But the Honeycomb app market is not that big at the moment so you'll only have around 100 to choose from - compare that with the 100,000 iPad apps on offer in the App Store. It's also really hard to find the Honeycomb-optimised apps when browsing Android Market. You can use Android phone apps on the Tab 10.1, but because you have to scale them up to fit the display they don't look good. There are other apps that just don't work well on the Tab 10.1 - for example, Skype can be used on the iPad and iPhone and Android Gingerbread mobile phones, but not on Android tablets. It's a shame because the tablet interface really lends itself to face-to-face video calling. Generally, we've not been impressed with tablet cameras, but the Tab 10.1 could be the one to convince us that a tablet can be used as a camera. Sure, its 3.15 megapixel camera is not up to the level of the cameras found on the top-end smartphones from Samsung, but nevertheless it produced better images than any other tablet - plus there's loads of settings and scene modes to tinker with. Even when enlarged on a computer screen, the images we took looked good, clear and were representing true colours. There is also a photo editor app, which offers all kinds of creative options for your images. As well as being able to do the usual resize and crop, you can do so much more. You can highlight sections of the image to be coloured or enhanced, and you can add effects such as motion blur. It may not be quite Photoshop but it certainly offers a lot of creativity. Samsung says its camera can record video at 720p, but we were disappointed with the results - the video was dull and rather grainy. Background noise was very apparent on the mic, but the frame rate was good and even when we panned, the camera was able to cope well. If Samsung set out to produce an Apple killer, it has certainly done a good job. 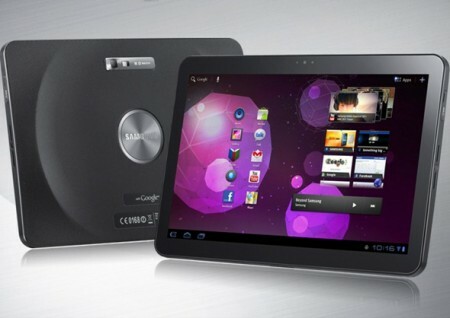 The Galaxy Tab 10.1 has a host of features, is very customisable, and has proved itself to be a powerful media device. While it may not look as good as the iPad 2, our real issue is with the fact there are so few Honeycomb tablet apps available. However, the Tab 10.1 does benefit from the smooth, user friendly Honeycomb operating system, and a top-notch video player. So as long as you can be patient awaiting new apps for the tablet, the Samsung Galaxy Tab 10.1 is a very decent device.